At any rate, reading is still something that my whole family (both sides now!) have in common. We love to swap and share and so I've asked my brother to write some posts from time to time. He recently read Just Do Something and launched into a discussion of it with me which I (somewhat successfully/somewhat unsuccessfully) avoided by asking him to review it for me! (Some might say that's a mean older sister trick. But actually I get more out of reading about books than I do in talking about them . . . strange as that may sound!) At any rate, here's a review by my favorite brother, Christopher. In Just Do Something A Liberating Approach to Finding God’s Will, author and pastor Kevin DeYoung has given the Body of Christ a useful guide to understanding what God expects of us, and what we should expect of ourselves, as we seek to make life decisions. I personally was very blessed and refreshed as I read the book. In fact, at this point my wife has now read the book, my Mom has read it, we have quoted from it extensively to our friends on various occasions, and we are purchasing additional copies of it to give away to folks as we have opportunity. It is clear that the author is writing with a Pastor’s heart. There is no heavy-handedness here; no pushy theology, simply the encouragement and prodings of shepherd who has seen too many sheep sitting idly in green pastures, distracted by a haze of spirituality and not seeing the lush provision they’re right in the middle of. 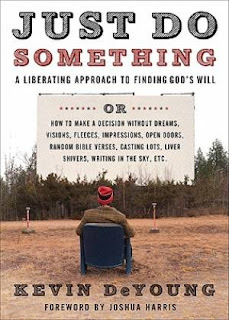 Filled with clear reasoning, practical examples, and sound exegesis, Just Do Something encourages you exactly as the title suggests, to get out there and walk in God’s will instead of waiting around for it to walk up and smack you in the face. “I’ll never forget my poor beleaguered roommate talking with me after he took a risk and told a nice young lady that he liked her. They went on a long walk. He was pretty sure that she would reciprocate his declaration of affection. But it turned out she wasn’t interested. She was a sweet girl, a good Christian. She didn’t mean to have bad theology. But instead of just saying “I’m not interested” or “I don’t like you” or “Quit stalking me” or something, she went all spiritual on him. “I’ve been praying a lot about you,” she demurred, “and the Holy Spirit told me no.” “No?” my confused roommate asked. “No… never,” she replied. You get the idea. Just Do Something is a call for Christians to take responsibility, and to seek God’s will for their lives with the right motives and the right expectations. I would recommend it for all Christians, but especially for those who are facing a major life decision and are wondering where God will lead them. If you choose to read this book, I pray that God will bless it to your encouragement and joy. Carrie here again. In answer to the question(s): No, I haven't read this book yet and yes, Christopher has successfully piqued my interest in it enough to make me wish I already had. (But that's partly because I hate it when my brother beats me to reading a really good book.) Yes, our sibling rivalry is teeeerrrible to behold!!! I just ordered this book from Amazon. It looks really interesting, and I can't wait to dive in. This is an amazing read and I recomend it to every Christian out there. This is such a refreshing and hard hitting approch to "finding God's will for your life" it is bound to challenge you in your Chirstian walk. This sounds very enjoyable -- I love the excerpt that you quoted.